Individual Investors Abandon Stocks; The ‘Death of Equities’ Redux? Throughout the 1990s, mutual funds were marketed to individual investors with stellar ten and fifteen year track records made possible by the record bull market of the 1980s and 1990s. While there were a few notable interruptions, with the 1987 crash being the most obvious, most individual investors learned to “buy the dips” throughout this period. Most large capitalization companies made significant advances in earnings during these years but the expansion in earnings multiples had the effect of turbo charging returns to investors. Of course, this all culminated in the bubble of the late 1990s, but small investors remained relatively optimistic for much of the past decade, having been trained to buy the dips for so long. However, optimism may now be turning to pessimism as small investors abandon stocks in disgust. With the Dow Jones Industrial Average and S&P 500 both at levels first breached over a decade ago, the “buy the dips” mentality has been dramatically reduced. 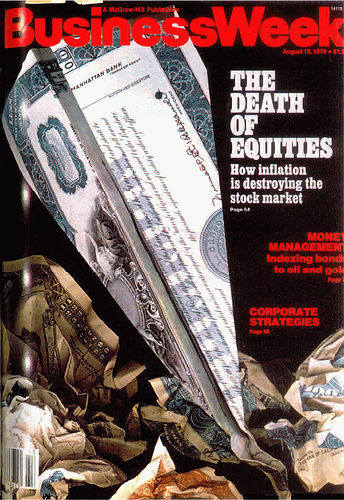 A recent article in The Wall Street Journal is somewhat reminiscent of the famous 1979 Business Week cover story entitled “The Death of Equities”. In the late 1970s, investors had endured well over a decade of stagnation in equity prices. The Dow Jones Industrial Average first breached the 1,000 level in 1966 but failed to permanently ascend beyond that level until 1982. The similarities between 1966-1982 and the period we are currently in are obvious and the pattern of investor sentiment turning against stocks may be repeating as well. Safety in Cash and Bonds? One major difference between the options available to investors in 1979 versus 2010 is that one could actually obtain decent returns from bonds and cash investments in the late 1970s and early 1980s. The primary reason for the high level of nominal interest rates during the period was very high inflation, but anyone who purchased long term treasury bonds in the early 1980s ended up with very satisfactory returns due to a combination of the high coupon and significant price appreciation due to the disinflation of the 1980s. While the disinflation that would take place over the following decade was not obvious to an investor in 1979, the fact is that high coupon treasuries were available as an option to stocks. Compare the situation to what faces investors today with yields on the ten year treasury near 3 percent and yields on cash equivalents near zero. An investor buying a ten year treasury note yielding 3 percent today is very unlikely to realize any significant capital appreciation. The only scenario under which significant capital gains will occur is a Japan style deflationary scenario where ten year yields crash to levels below 2 percent. Any uptick in inflation will result in massive capital losses as the price of treasuries and other bonds decline. An investor holding bonds to maturity is protected from the price declines in nominal terms, barring the risk of default. However, in real terms, a relapse of inflation will destroy significant wealth for anyone purchasing long term bonds at today’s yields. Investors buying treasuries today due to fear of additional losses in equities should at least consider other options for generating income with reasonable risks. The fact that a treasury bond will not result in capital losses in nominal terms if held to maturity does not mean that it is without risk. There are many alternatives to treasury bonds for conservative investors who wish to generate income while controlling risk. Many alternatives are far more likely to result in the protection of wealth as measured in real terms compared to a 3 percent ten year treasury. One such alternative is to purchase I Bonds or Treasury Inflation Protected Securities (TIPS) which offer a hedge against inflation along with a very modest real return. However, for this article we will focus on the possibility of using dividend paying stocks as an alternative. It must be stressed that dividends on common stock are not contractually protected obligations of the company. The Board of Directors is almost always free to pass common stock dividends at any time. As a result, investors looking for income must examine a company’s track record over many years, the competitive advantages of the business, and make an assessment regarding future prospects for the dividend. Simply buying the highest yielding stocks is a recipe for disaster. With these caveats in mind, we provide a sample of high quality companies with a solid track record of meaningful and rising dividend payouts. Most of the companies on this list yield over 3 percent, the current yield of the ten year treasury. Each of the companies listed above are well known, stable, and high quality businesses that have demonstrated an enduring ability to pay dividends on common stock over a long period of time. Equally important, each of these companies has increased dividends over time, in some cases by very significant amounts. The point is not to make specific recommendations but to illustrate the potential for purchasing dividend paying stocks to produce income. Paying too much attention to the dividend payment without looking at the overall valuation of the company. Our list above only includes companies where the payout ratio is reasonable and the valuations appear to be more or less “reasonable”. Companies may lose their competitive edge and have difficulty making payments going forward despite a strong track record. Overall stock market valuations may decline precipitously which would reduce the value of the portfolio even if dividend payments are not cut. Changes in tax rates on dividends in the future could cause companies to revisit their dividend policies which could result in slower rates of increase or, far less likely at least for our list, actual cuts in dividend rates in favor of more tax efficient buybacks. The federal dividend tax rate, currently at 15 percent, will increase substantially starting in 2011 if Congress fails to extend current tax rates. The point of this article is not to suggest that investors should abandon all bonds, or even that some government bonds should be included in an income portfolio. However, it seems unwise for investors to concentrate their entire portfolio in bonds with the hope that abandoning stocks will result in an elimination of investment risk. Instead, investors should consider maintaining at least part of their income portfolios in strong dividend paying common stocks that have the potential to increase payments over time and offer a degree of inflation protection. Disclosure and Disclaimer: No position in the companies listed in the article, all of which are provided only as examples of a potential dividend income strategy. Consult with your financial advisor to ensure that your portfolio and security selection is appropriately aligned with your personal financial situation. optimism may now be turning to pessimism as small investors abandon stocks in disgust. We certainly are moving in that direction, but the scary thing is how much farther down we need to go before we really can say that we have reached the Disgust stage and can realistically expect sustained upward movement. We’re at a P/E10 level of about 20. On all earlier occasions when we went to insanely high valuations, we ended up at a P/E10 of about 7. So we may have another drop of 60 percent ahead of us. How many more hits can our economy take? My view is that we all should be working together to help investors understand better what is happening and developing practices that would insure it would never happen again. Once we get people believing in the future again, I think a rebuilding effort can begin. But we need frankness about how big a hole we have dug ourselves. I agree that buying dividend-paying stocks makes sense. I think that one reason we had PEs of 7 or lower at times during the late 70s/early 80s was the high level of interest rates. With rates where they are now, it would be very surprising to see blue chips, on average, at a PE of 7 or 8. Of course, I don’t think that it makes sense to assume continued interest rates of 3% on the 10 year, but will we get to late 70s/early 80s levels? If we do, then stocks may be in for a rough time, but I still think investors will do better in some of the high quality names above than being in ten year bonds. I agree with your thesis on dividend-paying, high quality stocks. For the “emergency fund”, I am using Capital One bank, which is currently paying 1.35% – not too bad in this environment. I would love to hear your opinion on munis as well. @Pablo – I’ve never really been involved in munis so I can’t really provide any commentary. However, I do read about all of the budget instability and obviously doing a great deal of due diligence is required for that sector. Regarding using banks for short term funds, I entirely agree. With the FDIC limit of $250K, there is no reason why most people shouldn’t have their cash reserves in banks or credit unions. I’m earning 1.15% on cash myself at the moment – you can’t touch that in T Bills and the risk profile is identical.